designs,some huge some small, were really a treat to my eyes and lifted my spirits too. I embarked on the memory lane and recollected my childhood days when kite flying was one of my favorite hobbies. I was at Jodhpur International Desert Kite Festival, which is celebrated with great enthusiasm every year in the month of January starting on the occasion of Makar Sankranti. And continues for the next two days. Some of the best kite fliers had gathered there from far and wide to showcase their talent. The Polo Ground was the venue for the festival and huge crowd had gathered to view the event. No wonder this festival is a big hit with both residents and tourists. People of all ages were present at the venue. The children present there were full of live and their faces were brimming with joy. They were completely engrossed with the event and their voices were full of enthusiasm. I was standing near a group of children who while enjoying the sights of the colorful kites were singing a line, “Rangeela rangeela desh mera rangeela”. I simply loved it. They also released many colorful balloons in the sky. Wow! What a sight it was. 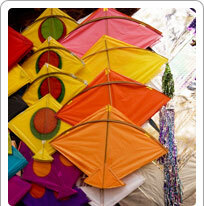 The creatively shaped kites, all competing with each other were building up excitement among spectators. I think everybody must have chosen their favorite kites. There was a huge kite in the form of a sunflower, which I found very attractive. Its sight reminded me of the line which I cherish a lot, “Be cheerful suns of happiness”. I from the depth of my heart prayed for its victory. The kites were flying higher and higher and suddenly a kite fashioned in the form of a peacock got cut. Quite bad, as I was thinking it would perform well. Anyway that’s a part of the game. Some flew high, some failed to fly and some got cut but the festival went on. To add more charm to the festival, the Air Force helicopters released many colorful kites from above. It seemed as if a palette full of different colors was suddenly poured in the sky. It was truly a sight to behold. Other attractions which I enjoyed here were the entertaining cultural activities like music and dance performances. 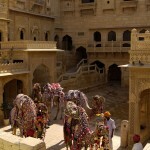 Reflecting the rich cultural heritage of Rajasthan, the performances were a great delight. I enjoyed the Jodhpur Kite Festival to the hilt and carried back with me some golden memories which will remain etched in my heart forever.